Amazon has signed a deal with the three former hosts of the BBC’s wildly successful car show Top Gear to produce a new automotive-focused program for the streaming service. 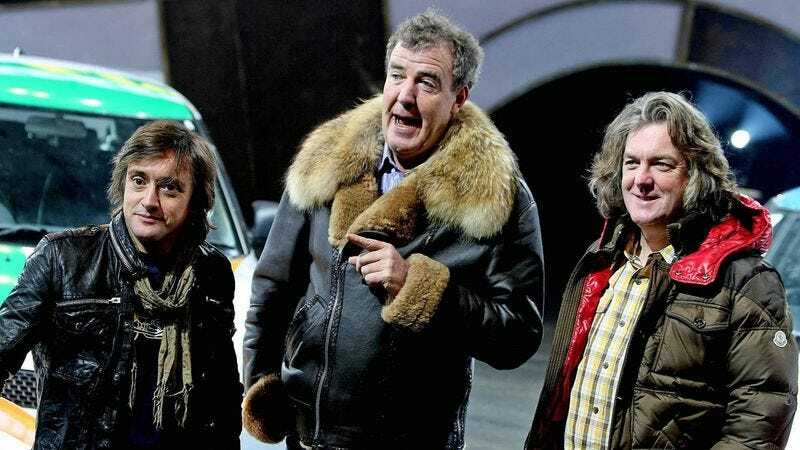 There are no details yet about what the new show will look like when James May, Richard Hammond, former Top Gear executive producer Andy Wilman, and producer-punching national treasure Jeremy Clarkson start shooting it this fall, except for the part where it’s probably going to look exactly like Top Gear, because Amazon pretty much just bought Top Gear. It’s hard to overestimate just how popular Top Gear actually is, despite the fact that, to the casual eye, it appears to be a series about a trio of older men cracking occasionally racist dad jokes in a series of ugly, unassuming cars. That’s apparently the formula for getting a show broadcast in more than 200 countries and territories, though, with hundreds of millions of people tuning in each episode to watch Clarkson say something amusingly disparaging about Vauxhalls, or maybe just people from Spain. The BBC recently cast Clarkson’s friend, radio personality and TV host Chris Evans, as the new lead for the show that now gets to fight against the popularity of its former hosts for the title of “the real Top Gear.” Amazon has already picked up the new series—Upper Cog? Higher Transmission Circle? Hey, It’s Us, The Guys From Top Gear, Come Watch Our Show, You Know You Will?—for three seasons, because that’s what you do when someone hands you a license to start printing money. Upper Cog is expected to start airing on Amazon some time in 2016.